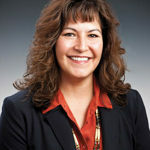 Michelle Anderson is the President of Ahtna, Incorporated. As an Ahtna shareholder, Michelle is a member of the Udzisyu (Caribou) clan. Raised in the Ahtna Region, Michelle graduated from Glennallen High School. She holds a Bachelor of Arts in Political Science from the University of Alaska Anchorage and a Master of Arts in Rural Development from the University of Alaska Fairbanks. Michelle is currently volunteering with the Alaska Native Sisterhood Camp 31 and the Blood Bank of America. 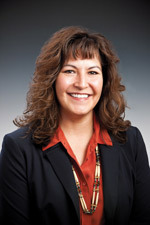 Previously, Michelle held Board positions on the Indian Dispute Resolution Services, Inc.; Council of Advisors for Alaska Native Studies Program at UAA; T-Birds Booster Club; and City View Little League. Michelle is also a “Top 40 Under 40” Alaska recipient. Michelle is the mother of two sons, Alexander and Austin, who are attending college. She is personally interested in learning Ahtna protocols, clan histories, Ahtna land use history, and Ahtna traditional stories, as well as Alaska Native political history, reading, genealogy, and writing.